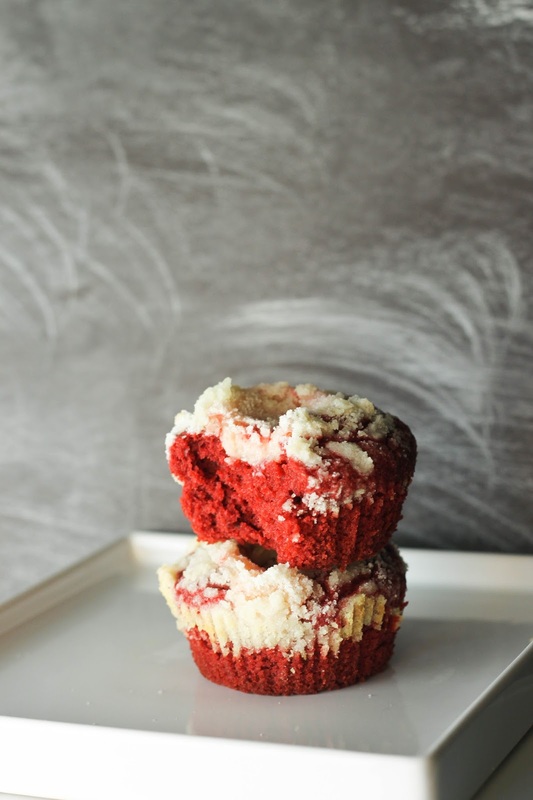 Seriously, what is with the red velvet craze? And I say this while fully under the spell of it too. There are two camps of people: those who get it and those who get irritated by it. Joe and I used to be those people until we tried the Sprinkles red velvet cupcake. I've had many bad cupcakes at Sprinkles, but the red velvet has never disappointed me. I know many people think it is just a red-dyed chocolate cake but it actually has just a little bit of cocoa, putting it in between a vanilla and a chocolate cake (but leaning more towards chocolate, of course). Ultimately it's the combination with tangy cream cheese frosting that sets it apart from the other flavors. 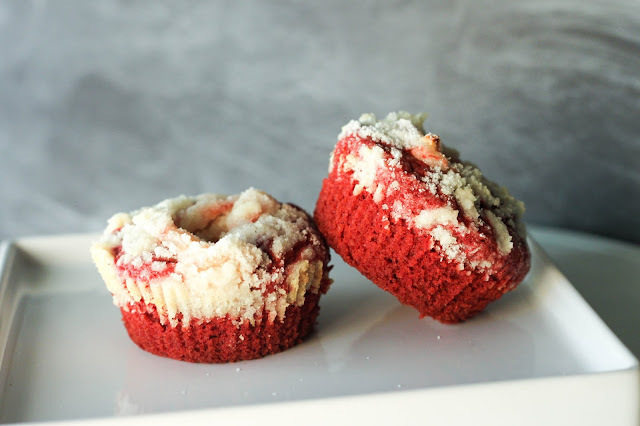 Most places ruin it by making the frosting so sweet that you can't even taste the tang, which I think is quite important in terms of enjoying a red velvet cupcake. IDK, I just love it, you guys. Since then, I've dabbled in many red velvet type things. Red velvet oreo butter, red velvet cheesecake ice cream, red velvet cake bars, and my favorite cake recipe. When I tried these cream cheese muffins, I honestly had no idea they were going to be as delicious as they were. I had to give them away as soon as I took a bite because I just knew I could eat about five in a sitting. Joe texted me from the hospital to say everyone was oohing and awing over them and wanted to know if I could make more. These look absolutely stunning as part of a brunch, or even a tea party. They're crazy addictive and bake up quickly. Good luck eating just one! Preheat the oven to 375 degrees. Line a 12-cup muffin pan with paper liners. In a large mixing bowl, whisk together ½ cup sugar, the buttermilk, canola oil, egg and food coloring. Add 1¼ cups flour, the cocoa powder, baking powder and salt and whisk gently until just combined. Be careful not to overmix. Set batter aside. 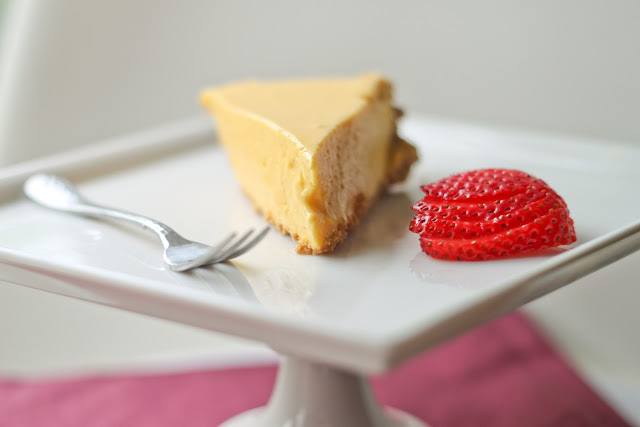 In another bowl, mix the cream cheese, ¼ cup sugar and vanilla extract together until combined. Pour 2/3 cup batter into each muffin cup. Add a small dollop of the cream cheese mixture into the center of each batter-filled cup and use a toothpick to swirl the cream cheese a little. Set aside. In another bowl, cut the butter together with the remaining ¼ cup sugar and remaining ¼ cup flour until the mixture is crumbly and the butter forms pea-sized pieces. Divide the crumb mixture evenly over the tops of the muffins. Bake 17 to 19 minutes, until a toothpick inserted in the center of a muffin comes out with just a few crumbs. Let cool completely before serving. I"ll admit it: i'm a lover, not a (red velvet) fighter. Embarrassing, maybe, but it's true what you said about it not just being a chocolate cake with red coloring: there's something unique about red velvet flavor, and i guess it's nice just to appreciate it for what it is. I think it goes without saying that i'd be ALL OVER these muffins, then. I think i've made that clear.